Yes, if I were like Zoella from yesterday's post, I would have made a video about this. Alas, this item is very small indeed and wouldn't make much of a video. However, before I go into what I actually bought, I'm going to give you a little history. A couple of years ago, on one of my many trips to the Queens Center Mall, I purchased the first liquid eyeliner I ever really felt like I knew how to use. When it comes to eyeliner, I usually try to stick to drugstore brands. When I'm using a pencil, I actually prefer NYC and Wet'n'wild to any of the other, more expensive drugstore brands. On this day, though, I bought Urban Decay's 24/7 Liquid Liner. At $20, that was pretty steep for me, considering what I usually buy. After using it, though, I was impressed. The Urban Decay liner is waterproof and smudge proof after it dries, and when you get in the shower to take it off, it just sort of peels off. When I ran out of the Urban Decay eyeliner, I went back to the pencil, and then I started using Maybelline's Master Precise. In Target, though, the other day, I saw that NYX had some very well priced colorful eyeliners, and so I purchased one. At $4.50, this is a little less than a quarter the price of the Urban Decay liner, but it does the same thing in the shower! So, I had to share. I am liking it so far, and I think it's such a bargain you should check it out, too. Don't worry, though. They also make black, brown, charcoal grey, and light grey, so you've got some more neutral choices as well. Now, if you're wondering what else is in my core beauty bag, I've put together a list of links below. If you need more of a visual, though, I've also made a box on Boxagon, though not all the colors came up in the search there, so it's more for fun than anything else. I think this is supposed to be only for blemishes, but I think it works pretty well under the eye as well. This looks neon pink in the pallet, but it's actually really nice when it gets on your face. I bought this on my birthday last year, and it's got a retro barbie feel to it. I like it. This is a more complex color of blush than the Nars one, and I think some people also use parts of it as a bronzer. I think it's nice. I almost returned this after I bought it because it was WAY too expensive, but I actually really like it. It's a nice highlighter for the cheekbones and the brow line. Officially my favorite Mascara I've ever had. I also like that it's available pretty much anywhere. Suggested to me by my cousin Katie, I like this as a liquid liner-alternative. The only thing I will say that I don't like is that it has the tendency to smudge. I like to solve this by putting it on before I put the eyeshadow on. Powder shadow helps to set the ink liner. My mom suggested this to me after she read or heard somewhere it was Chanel's #1 best seller. Ladies, it's a best seller for a reason. It's neutral with a little bit of shine, and it feels like chapstick. I have officially finished two tubes of this stuff (thought not in the same color). Actually finishing a tube of lipstick really means something. I rarely do that. I think I've had this eyeshadow palette for three or four years, and two of the squares are almost completely empty. I wear some combination of the three almost every single day. I'm sure there's a cheaper version on the market, but I really do love to be shown how to use what I'm buying, so i stand by this purchase whole heartedly. Every now and then I like to get adventurous with my lip color. I bought this one because the woman at Nordstrom here in Atlanta actually paid attention to me. It's a little out of my comfort zone, but with a little clear lip liner, it's doable. This is a cool lipstick, too, because the first coat is fairly sheer, but the more you put on, the more opaque it becomes. Pretty cool. Annnnd...in case you want to see all of it, check out this box on Boxagon! 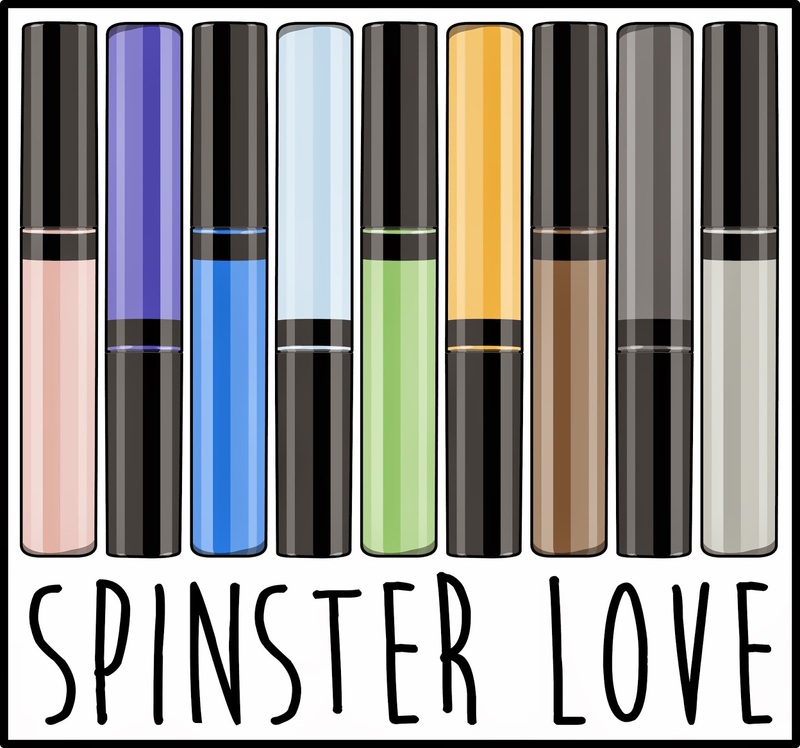 The Spinster's Beauty Bag by Sarah Jones on Boxagon.